Don’t you hate it when you go to a conference, or see a speaker, and it up-ends all of your plans? I am teaching a non-AP statistics class for the first time this year. The way our system is set up, this class consists of almost entirely seniors who have had a hard time throughout their time at our school, completing either through algebra II, college algebra and trig, or in some cases precalculus, but are not taking calculus or AP statistics as seniors. It is a class with limited pressure and unlimited potential; we want them to come out with some basic statistical understanding, of course, but the biggest goal is to provide many of these students with an opportunity for a math win. I am SO excited to be teaching this class. The fun of statistics without the pressure of the exam?? Sign me up! It helps that the group of girls 1 I have this year includes several girls I’ve taught before, including two I will be teaching for the fourth time! (seventh grade science, eighth grade science, tenth grade geometry, now) so I have a good rapport and relationship already set up. So my original plan? Keep it simple. We have a good book (Statistics through Applications), there’s another section taught by a lovely lady who has taught it for years, and I was just hoping for a casual atmosphere and problem discussions. Group work. Posters. Surveys. Chart-making. But nothing difficult to plan or difficult to implement, since my AP curriculum will be rather intense and new this year. Our first speaker of the year, Michael Vandenbergh, law professor at Vanderbilt and former Chief of Staff of the E.P.A. came to speak to us about our theme for the year of sustainability. And man, was that visit cool. Okay, first of all, why do cheese and salmon have to be so high on this list??? I recently stopped eating meat (mostly) because I heard it was the best single thing I could do for the environment from many reputable sources, but this graph makes me think I should bring chicken back and kill mac and cheese. There is a lot of there here. Because… do I really trust this graph? What are its sources? Should I be measuring this by kg, when I am far more likely to eat half a pound of chicken than half a pound of cheese? Is that farmed or wild salmon? What about water use, which I am also concerned about? And now, I have a new class. This is going to be our lens. We will spend our first day or two finding every single chart, table, or graph about topics regarding sustainability we can and throw them in a google doc. Then we talk about what types of charts we see: which are helpful, which are misleading, how could we make each one if we had the raw data? Next, everybody will pick a few of them that makes them question something: something about the truth (what foods really ARE the “worst” on different measures of sustainability? What things SHOULD we really be sure to recycle?) Then we spend some more time going on a hunt for data. As much data as we can find. This is where I lean on the librarians. We will read a few actual papers. We will scour the web for data sets. We will analyze the data sets (and learn about univariate and bivariate data analysis in the process, one hopes). Here, we talk about how to decide whether the data is reliable: how do experiments and surveys need to be conducted to be reasonable? What are some things to look out for (both mathematical and sociological – follow the money!) We make notes of things in the paper we don’t understand but want to come back to later (e.g. p-values). Cause and effect? Confounding variables? At some point, we will have to do probability, and sustainability becomes harder to integrate. Still need to think about that. But honestly, by the time we get through all above we may want a break from sustainability anyway. Okay, this is awesome. But it’s so much HARDER than just following the book. Darn it, Vandenbergh, now I’m going to have to be a better educator, and it’s all your fault. Thomas Dietz, Gerald T. Gardner, Jonathan Gilligan, Paul C. Stern, and Michael P. Vandenbergh. 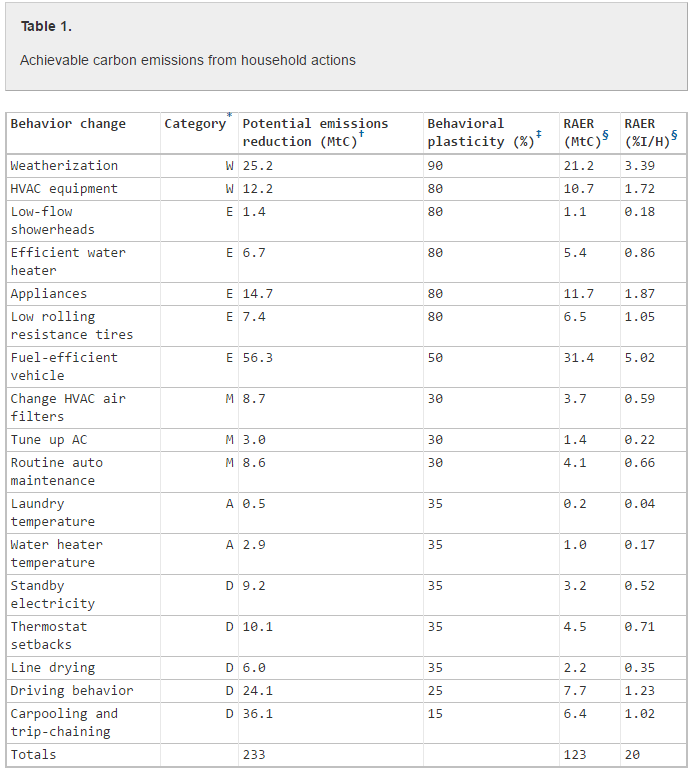 Household actions can provide a behavioral wedge to rapidly reduce US carbon emissions. PNAS 2009 106 (44) 18452-18456; published ahead of print October 26, 2009. What fun to have the flexibility to do this kind of thing! You might talk to Hedge (@approx_normal), at one point, she had a lot of resources regarding a non-AP class regarding statistical literacy, which is what your post reminds me of.